Oklahoma quarterback Kyler Murray (left) and Alabama quarterback Tua Tagovailoa (right). 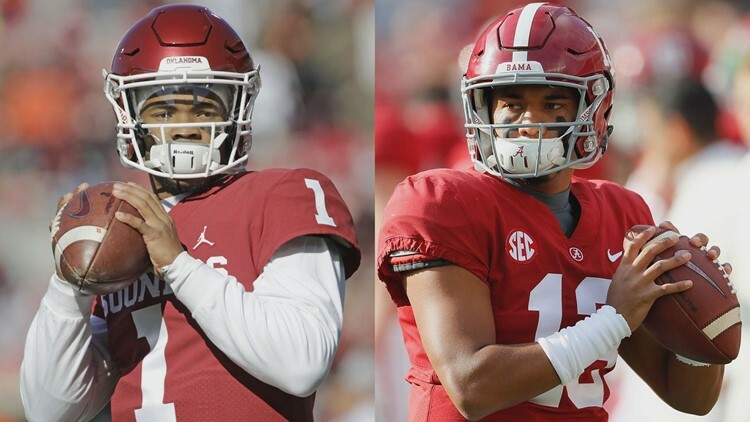 Kyler Murray vs. Tua Tagovailoa: Who wins the 2018 Heisman Trophy? ESPN will broadcast the Heisman Trophy award presentation on Saturday night. NEW YORK – The winner of the 84th Heisman Trophy will be announced this weekend in New York City. Oklahoma quarterback Kyler Murray, Alabama quarterback Tua Tagovailoa and Ohio State quarterback Dwayne Haskins were named finalists this week for college football’s most prestigious individual award. Journalists/wannabe college football insiders Mark Bergin and Lara Saavedra try to answer some of the most pressing Heisman questions ahead of the big announcement at 8 p.m. ET Saturday. What was your reaction when the Heisman nominees were announced? Mark Bergin: Headed into conference championship weekend, you knew it would be a three-man two-man race. West Virginia quarterback Will Grier just missed earning an invite to New York. Back-to-back losses at the end of the season to Oklahoma State and Oklahoma likely put the nail in his Heisman campaign. Haskins deserves the trip to the Big Apple, but he isn’t a serious contender to actually win this year’s Heisman Trophy. Lara Saavedra: I kind of feel bad for Will Grier. I loved watching him play this season, especially his two-point conversion against Texas, but he made too many mistakes late in the season. It cost him a trip to New York. He had a great season and I hope he can continue his football success in the NFL. Getting nominated for the Heisman is a highlight of any player’s career. Tua Tagovailoa and Kyler Murray are worthy of the nomination. I wasn’t shocked Ohio State quarterback Dwayne Haskins was nominated since his name started popping up at the end of the season. He earned it. But then here comes his coach – Urban Meyer, one of the most polarizing figures in college sports – announcing his “retirement” on the heels of Haskins’ big moment. The timing was uncomfortable and lacked a sense of awareness (read the room, bro!). Don’t take the spotlight from a kid trying to make it to the next level. Wait a week until after the Heisman Trophy presentation, and then do you. Bergin: Agreed for the most part about Meyer stealing the headlines from Haskins. However, a likely reason Meyer announced his retirement this week is due to college football’s early signing period from Dec. 19-21. The early signing period started in 2017. Most of the blue-chip recruits now sign in December instead of February so they can enroll early as student-athletes in the spring. So much for attending senior prom! Perhaps Ohio State’s administration wanted to establish Ryan Day as the head honcho even before he officially moves into his new role as the 25th head coach of the Buckeyes on Jan. 2, 2019. I agree though; Meyer could have waited until next week to make his announcement. Why should Kyler Murray win the Heisman? Bergin: The Sooners’ defense is papier-mâché, or – at best – a matador defense. It’s part of the reason defensive coordinator Mike Stoops got fired after the 3-point loss to Texas midseason. 1. The Sooners rank 108th nationally among 129 FBS schools in total defense. Oklahoma allows 448.1 yards per game, which is second worst in the Big 12. 2. Oklahoma ranks 96th nationally in scoring defense. The Sooners allow 32.4 points per game, which is second worst in the Big 12. 3. The Sooners rank 82nd nationally in turnover margin. Oklahoma is -2 in turnover margin. More importantly, the Sooners have forced a mere 11 turnovers this season, which is tied for seventh worst in the country. 1. test the waters to see how he would grade at the NFL level? Esteemed ESPN analyst Todd McShay graded Murray as a first-round draft pick if he were to enter the 2019 NFL Draft. He lacks the traditional stature for an NFL quarterback. However, there are the exceptions of Russell Wilson and Drew Brees, who both tower over Murray. 2. play out his collegiate eligibility and suit up for one more season at Oklahoma? I don’t think this option is likely, but I haven’t enjoyed watching a college football player this much since Johnny Manziel was at Texas A&M. I love how Murray has marketed himself as a two-sport athlete during his Heisman campaign in an homage to Bo Jackson. Imagine the possibility of Murray becoming a two-sport star professionally in MLB and the NFL. Saavedra: Mark is right about Oklahoma's defense. It’s abysmal and embarrassing at times, but you know what, the defense always manages to do just enough to allow Kyler Murray and the offense to eke out a win. Murray is the most dynamic player in college football, period. Take away Murray, and the Sooners are not 12-1 and not in the playoff. Some even argue they are not deserving of a playoff spot because of the defense. But Murray is the difference. His explosive numbers, ability to read the field and pretty much outrun everyone is why he should win the Heisman. Murray is a playmaker and can turn a one-yard loss into a first down touchdown. We’ve seen it time and time again this season. How could you not love this kid?! Kyler Murray is a straight up cheat code. In addition to Murray being a record-breaker and all-around star, he continues the tradition at the University of Oklahoma. Murray is the 10th Oklahoma Sooner to be named a finalist since 1982, most nationally. If Murray takes home the Heisman, Oklahoma will tie Notre Dame, Ohio State and USC with seven winners. Why should Tua Tagovailoa win the Heisman? Bergin: Alabama has been so dominant this season, Tagovailoa had only attempted three fourth-quarter passes entering the SEC title game. Tagovailoa has now thrown only eight fourth-quarter passes for the entire season before he left the conference title game with an ankle injury against Georgia. Part of the reason his stats aren’t as impressive on paper compared to Murray and Haskins is that he hasn’t played much in the fourth quarter and left games early with injuries. Despite this, Tagovailoa set a school record with 37 passing touchdowns. No doubt Tagovailoa’s 10-of-25, 164-yard, one-touchdown performance against Georgia in the conference championship was pedestrian. However, he had five 300-yard passing games this season and accounted for a school-record six touchdowns — five passing, one rushing — in the Iron Bowl against bitter rival Auburn. Tagovailoa was named AP’s SEC offensive player of the year and was a unanimous pick as the first-team quarterback. He seeks to become Alabama’s first quarterback and the third Crimson Tide player to win the Heisman. It’s also worth noting, Alabama beat five teams currently ranked in the top 25 of the College Football Playoff rankings. Oklahoma and Ohio State beat such three teams each. Alabama also beat four teams ranked in the AP Top 25 at the time of the game. Ohio State beat five such teams and Oklahoma beat three. Saavedra: Tagovailoa has had a solid season, but since Alabama’s regular season schedule didn’t provide much of a challenge for the Crimson Tide, he never had to play an entire game for a lot of his season. As an OU alumn, I wouldn’t be upset if Tagovailoa won the Heisman if that means the Sooners win the Orange Bowl. The supposed “Heisman curse” is more of a coin flip in recent history. Since 1992, Heisman winners hold a 9-9 record in the national championship or College Football Playoff semifinal games. In 2000, Florida State quarterback Chris Weinke won the Heisman. However, he lost the national championship game to Heisman finalist Josh Heupel and the Oklahoma Sooners. The same thing happened in the 2006 Rose Bowl when Heisman finalist Vince Young and Texas beat USC and former Heisman Trophy winner Reggie Bush. Note: In September 2010, Bush voluntarily forfeited his 2005 Heisman Trophy after allegations surfaced that he received improper benefits while at USC. It’s almost like a battling cry for teams if their guy doesn’t win. It could serve as the motivation Oklahoma needs to stop Alabama. Why should Dwayne Haskins win the Heisman? Bergin: Ohio State could have scored 100 points on Northwestern in the Big Ten title game, and Haskins still wouldn’t win the Heisman this year. Most of Haskins’ stats are as good or better than his fellow Heisman finalists. However, Ohio State’s 29-point loss to Purdue is the worst defeat among the finalists. The redshirt sophomore is Ohio State’s first Heisman finalist since Troy Smith won the award in 2006. He set more than 20 school records this season. Haskins led the nation in touchdown passes and yards. He ranked second nationally in passing yards per game (352.31). He is attempting to win Ohio State’s record-setting eighth Heisman. Saavedra: I think Haskins knows he’s not going to win, but I think he’s just stoked for the experience. I would be. Who should win the Heisman? Bergin: I’m going with the oddsmakers. I would select Kyler Murray as my pick to win the 2018 Heisman. Voters can’t go wrong between Murray and Tua Tagovailoa. Saavedra: Murray should win. His performances ALL SEASON LONG speak for themselves. He got my vote. Who will win the Heisman? Bergin: Despite oddsmakers now showing Murray as the favorite, I think Tagovailoa actually wins the Heisman due to a little bit of “SEC bias” (never mind that the SEC has won nine of the last 12 national championships!). In the last 10 years, the SEC has four Heisman winners, the Big 12 has three, the ACC has two and the Pac-12 has one. Saavedra: Tagovailoa wins the Heisman. He’s been the favorite this season and rightfully so. Mark Bergin is a journalist with 10News WTSP. Like him on Facebook and follow him on Twitter and Instagram. You can also email him at mbergin@wtsp.com. He is a graduate of the University of Missouri. Lara Saavedra is a journalist with 10News WTSP. Follow her on Twitter or email her at lsaavedra@wtsp.com. She is a graduate of the University of Oklahoma.